The upcoming coupe variant of the Ghost sedan is anticipated to debut at Frankfurt 2013. When BMW rolls out a new model, it typically spins it off into numerous body-styles. And the same goes for its subsidiaries. Mini does so to no end, and while Rolls-Royce may be more reserved in this manner, it follows the same formula. So just like the Phantom sedan has lead to coupe, convertible and long-wheelbase versions, so will the Ghost. The extended-wheelbase Ghost has already been launched, and now we&apos;re looking at the coupe version getting ready for production. Expected to revive the Corniche nameplate, the coupe version of the Ghost sedan was just spotted testing on the streets of Munich, Germany. 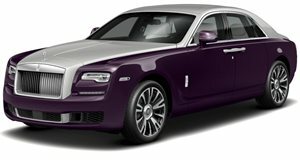 The overall shape is quite similar to the Ghost, and in an apparent ploy to throw us off the lead, Rolls-Royce actually added a pair of fake rear door handles on top of the swirly camouflage. Sources expect, however, that the coupe will have just one pair of "suicide" doors like those found on the larger Phantom coupe. The 563-horsepower 6.6-liter twin-turbo V12 from the Ghost will likely carry over when the 2014 Rolls-Royce Corniche debuts at the 2013 Frankfurt Auto Show.